One of our favorite all-around cars on the market is the Audi A5 Sportback. Not only does it pack more cargo space that the typical Audi A4 but it’s lower, wider and sportier to drive. 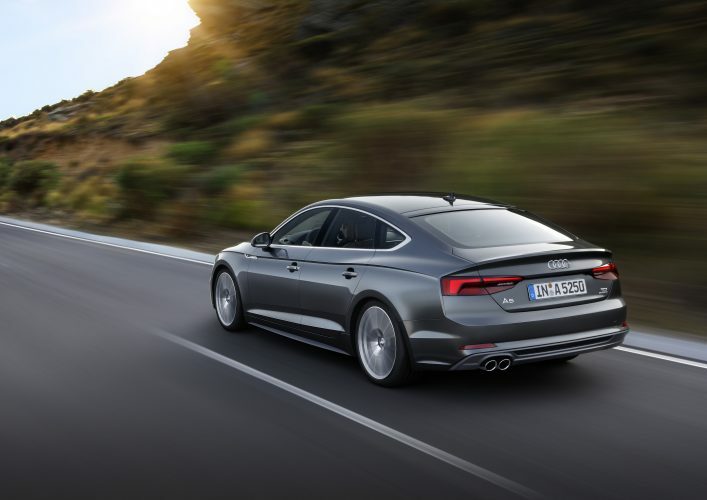 It drives more like an Audi A5 Coupe than it does the A4, yet it sports four doors, a big trunk and a liftback tailgate. But we’re not the only ones who are big fans. Car and Driver just recently did an in-depth review of the A5 Sportback and gave it four and a half starts out of five. Under the hood of the Audi A5 Sportback, you get a 2.0 liter turbocharged four-cylinder engine with 252 hp and 273 lb-ft of torque. That punchy little turbo-four is paired with a seven-speed dual-clutch automatic and drives all four wheels. That helps it get from 0-60 mph in five seconds flat. That’s damn quick for a standard Audi A5 Sportback and far quick enough to be fun. The only car in the segment quicker is the KIA Stinger S, which has a twin-turbocharged V6. And its rapid-shifting dual-clutch transmission helps make it feel like a proper sports car. C&D also feels that its handling is among the best in the segment. Its well-weighted steering and dynamic chassis make it fun to drive on a twisty road and it’s a proper driver’s car. It’s nice to see some love for modern Audis, as they’re often panned for their numb steering. But the new Audi A5 Sportback is a natural athlete. On the inside, the A5 Sportback has the same great interior as the A4 sedan and it’s best-in-class. It packs great technology, including Audi’s MMI system and its brilliant Virtual Cockpit, as well as superb materials and build quality. Although, it is a bit cramped in the backseat, thanks to its proportions and sloping roofline. That’s the price you pay, though, for having the better looks and driving experience of the A5 Sportback. Overall, it’s a great package, the Audi A5 Sportback. It looks better than the A4, it has more cargo space than the A4 and it drives better than the A4. Sure, it’s a bit more expensive and it has a more cramped back seat but it’s worth those compromises.